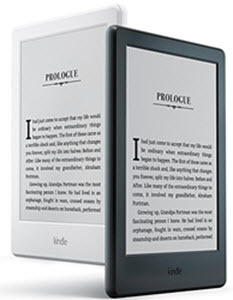 This page provides information about ereaders and other devices for reading ebooks. You might also be interested in our ebook software page. 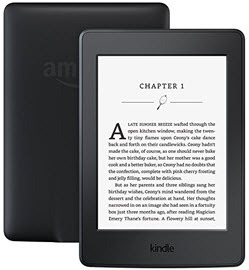 Kindle E-reader: Amazon.com's basic Kindle E-reader has a glare-free touchscreen display, Wi-Fi and built-in Audible. The Kindle has a 167 ppi resolution. It has 4GB of storage and gets weeks of use per charge. It weighs 5.7 oz. It is available in black or white color options. It retails for $59.99. 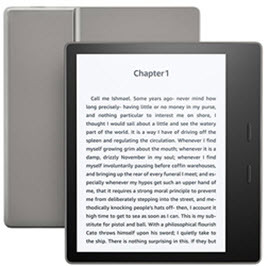 Kindle Paperwhite: The Paperwhite has a 6-inch glare-free screen and a 300 ppi resolution. Cellular connectivity is available with the Paperwhite. It has 4 GB storage and a built-in 4 LED light. It is available in black or white color options. It retails for $119.99. 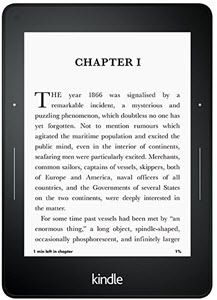 Kindle Voyage: The Voyage has a 6-inch glare-free screen. It features a touchscreen plus a page press feature. It retails for $199.99. Cellular connectivity is available. It has 4 GB storage, a built-in light with 6 LEDs and an adaptive light sensor. Kindle Oasis: The Oasis is Amazon's premium ebook reading device. It has a 7-inch glare-free screen. It has 8GB or 32GB of storage capacity. It has a built-in light with 12 LEDs and an adaptive light sensor. Cellular connectivity is available. It is IPX8 waterproof. It is available in graphite or champagne gold color styles. It retails for $249.99. 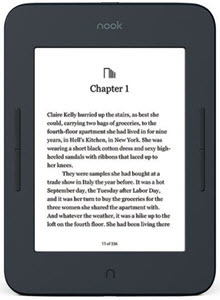 The Nook is an e-reader sold by Barnes & Noble. Features include physical page turning buttons, night reading mode and 50-day battery life. It has a 6-inch screen with 300 dpi resolution. It retails for $119.99. 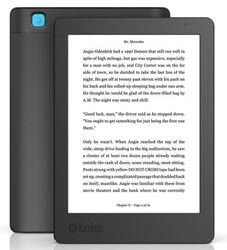 Kobo Aura: The Kobo Aura is an ebook reading device with a 6-inch Carta E-Ink touchscreen. It has a built-in, adjustable ComfortLight. It has 4GB of memory and supports 14 file formats. It costs $119.99 and can be ordered from Rakuten. 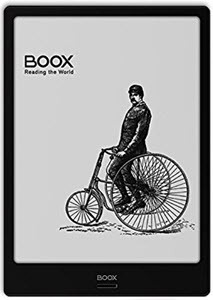 Boox Note Ereader: The Boox Note Ereader an Android 6.0 ebook reading device. It has a 10.3-inch dual touch HD display. You can have an ePub or Mobi open on one side of the screen and the note app on the other. It retails for $549.99. This section lists some ebook devices that are no longer available or no longer being developed. Everybook, Inc. is developing the Everybook Dedicated Reader, a two-page electronic book reading device. The eBookman is a device similar to a handheld computer or Palm Pilot, but with a larger screen. The eBookman is avialable in three different models which range in price from $129.95 to $229.95. The hiebook combines an XML based, OEB-compliant eBook reader, an MP3 player, a digital audio recorder, PDA functions and games in one device. XLibris uses a high-resolution pen tablet display along with a paper-like user interface. The user can hold a scanned image of a page and mark on it with digital ink. An unusual electronic reading device being developed at MIT. The device aims to merge (and extend) the capabilities of modern laptop computers with the aesthetic and evocative qualities of an antique writing box. Nuvomedia's ebook device is the Rocket eBook, a paperback-sized electronic book. Nuvomedia and ebook device manufacturer SoftBook are both owned by Gemstar. More information about the Rocket eBook can be found at: http://www.rocket-ebook.com. Qubit is an electronic reading device that is roughly the size of a magazine. For applications that require typing, both an onscreen keyboard and wireless keyboard with a remote infrared link are provided. RCA eBooks from the Gemstar eBook Service include the hardcover size REB1200 model (pictured on the right) and the paperback size REB1100. The REB1200 also has a color display. SoftBook is a leather-bound device designed for reading books and periodicals that weighs 2.9 pounds. SoftBook and ebook device manufacturer Nuvomedia are both owned by Gemstar. The Sony Reader is designed to be a lightweight travel companion with easy to read screens that use electronic paper technology. It is about the same size as a book.